Little Mr Poonlop  Pass it on! 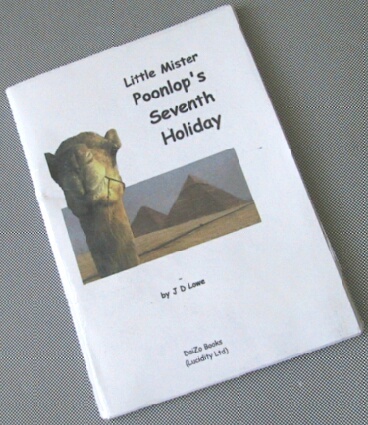 Mr Poonlop and I would love you to tell us if you've enjoyed his first book. I'd even like to hear if you haven't, especially if you can tell me why not or how I might make the next one better. But we'd also like you to tell all your friends, out there in Webland or even in what we used to call "The Real World". Then maybe they'd like to read it too. You could print them a copy as a present  or just send them to this site. Perhaps you've come here because a friend told you it was worth a look. Maybe you got a copy of Little Mr Poonlop's Chain Letter (which isn't really a chain letter). If you did, we hope you feel like forwarding it to some of your other friends  or even your enemies, if you didn't like it. Do add a message of your own too: make it more personal and friendly. Give the mail a nice Subject like "A Really Funny Book" , "Little Mr Poonlop is here" or "Have you got any custard?" If that's all too much for you, you can return to his Little Home Page anyway.